Reference number for this case: 4-Oct-54-Brive. Thank you for including this reference number in any correspondence with me regarding this case. Monday evening at 10 P.M., M. Marcel Mazouaud, an art dealer of Louis-Mie street (Brive) saw something moving in the sky, apparently just about over the school of domestic science. It was a sort of luminous ball which lighted up the whole sky. It disappeared, after M. Mazouaud had watched it for 4 or 5 minutes, in the direction of the Bordeaux road. He had time to take his field glasses, and to notify his wife and his neighbours, M. and Mme Gagnebe, who also saw it perfectly. (Presumably there was more, telling what he saw through the glasses). 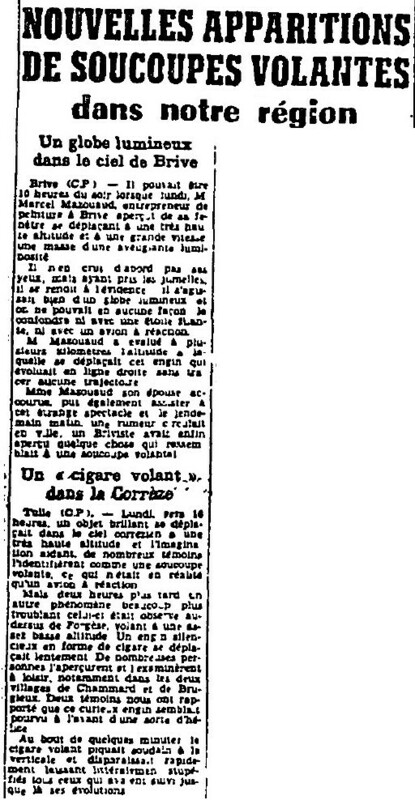 [---] Article in an undetermined French newspaper, October 6, 1954. [bb1] US Air Force projet Blue Book file for 1954, including a fragment of a french newspaper article for october 6, 1954, NARA, Washington, USA. 1.1 Patrick Gross December 29, 2016 Addition [dm1].